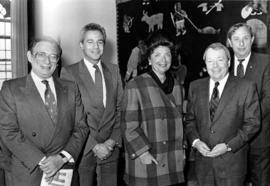 Photograph depicts (l-r) Charles Zaionz, CJC Ontario Region Chairman; Jack Silverstone, CJC National Executive Director; Dorothy Reitman, CJC National President; David Crombie; and Alan Rose, Executive Vice-president. 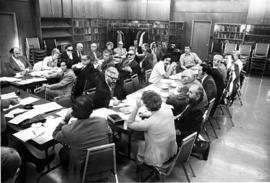 Photograph depicts a group of people at tables with documents. Photograph depicts twelve unidentified men standing behind an unidentified man who is seated at a bureau. Photograph depicts Canadian film industrialist, Nathan A. Taylor, in academic dress to receive a Doctor of Laws Degree at York University convocation ceremony. Colour Kodachrome 35mm slide depicts Phyliss Snider and Harry Nemetz posing by the Centennial flame. The flame is not currently lit.